RPC Promens Industrial and RPC Promens have developed practical containers for Dow AgroSciences to minimize environmental impact. 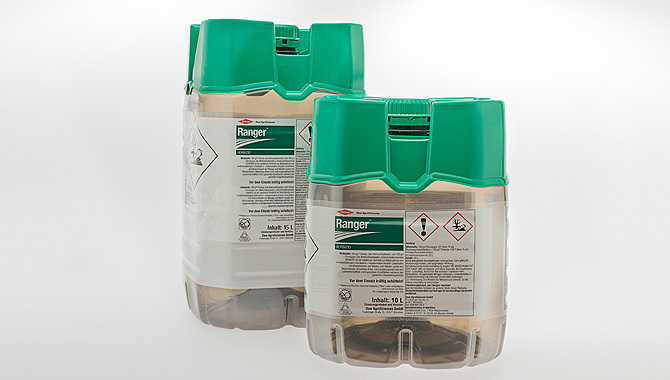 A range of Dow AgroSciences’ liquid crop protection formulations are being benefitted with the new packaging solution, which is offering enhanced logistics, easier handling and a reduced environmental impact. A specially-designed safety top makes the 10 and 15 litre PET containers auto-stackable. It removes the need for an outer cardboard box. RPC said the new packs are about 30% lighter than the HDPE containers they have replaced. The square design offers better strength and durability, as well as improved handling. It provides a competent palletisation pattern for increased pallet loads. The increased pallet load and bottle weight reduction allows to lower carbon dioxide footprint by 20% per litre over the bottle’s lifecycle, when compared to the currently-used HDPE jerrycan. The centred 63mm neck is compatible with closed transfer systems and enables easier pouring, RPC said. Operator exposure will be minimized to concentrated product with the help of bore seal caps as no further sealing should be cut. The safety top can be removed once the user goes for a separation before recycling. Dow AgroSciences’ EMEA packaging team said: “The new packs represent a major advance in terms of their lightweighting, improved logistics and elimination of the outer case, all of which have reduced their overall environmental impact. Image: The 10 and 15 litre PET containers feature a specially-designed safety top that allows them to be auto-stackable. Photo: courtesy of RPC Group Plc.